A walk into the peaceful woodland with the Autumn sun filtering through the last leaves on the trees. On days like these I only want to be in one place, and that is here. Peaceful that is until the annual start up of the Stihl motor on the chainsaw. 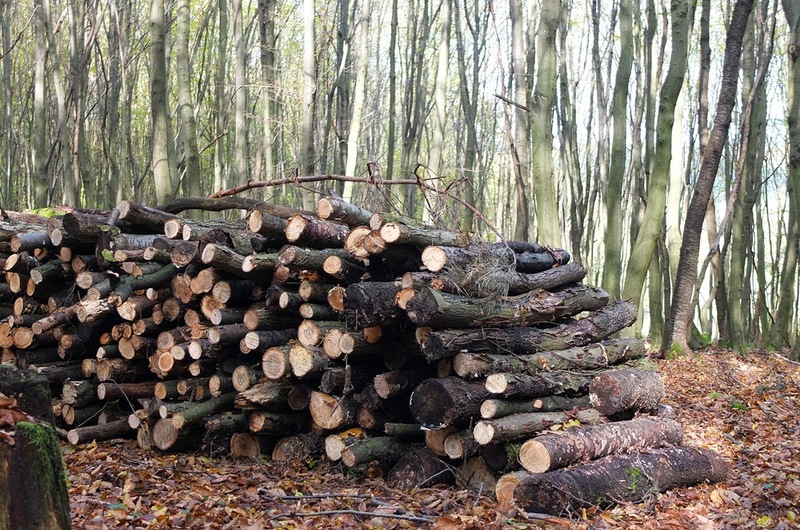 Although we have enough wood for the next couple of Winters (hopefully), a ticket for another supply within walking distance of home should not be scoffed at. This may sound greedy but In future years there may not be any in such locality and for the same price. But this year I am cutting alone. Our trigger-happy chainsaw slicing neighbour could not wait for our return from a fortnight break away and had worked in the forest without us for his own supply. Selfish b**tard! Nevermind, I can pace my day without his taunts and complaints this year. Whilst the chains on his tractor may have been handy, my trusty rust bucket wheelbarrow can handle most terrain for the transportation of the cut wood to the stacked up inspection point. Tough, but I have a week to do all this in and the fallen wood that I am allowed to take is mostly very carriable by hand. In this part of the woodland I am ever watchful. Straying eyes round these parts have been known to walk off with your hard work before you trailer it away. After three days and a slightly sore back I have reached our limit with what we allowed to take. Another year of fuel supply sorted and now time to close down the hatches for the colder months to come.